Bacteria also can destroy β-lactam antibiotics enzymatically. β-Lactamases are capable of inactivating certain of these antibiotics and may be present in large quantities. Different microorganisms elaborate a number of distinct β-lactamases, although most bacteria produce only one form of the enzyme. The substrate specificities of some of these enzymes are relatively narrow, and these often are described as either penicillinases or cephalosporinases. Other "extended-spectrum" enzymes are less discriminant and can hydrolyze a variety of β-lactam antibiotics. β-Lactamases are grouped into four classes: A through D.
Class A β-lactamases include the extended-spectrum β-lactamases (ESBLs) that degrade penicillins, some cephalosporins, and, in some instances, carbapenems. Perhaps most worrisome of the class A enzymes is the KPC carbapenemase that is rapidly emerging in the Enterobacteriaceae. This enzyme confers resistance to carbapenems, penicillins, and all of the extended-spectrum cephalosporins (Jones et al., 2008). Some class A and D enzymes are inhibited by the commercially available β-lactamase inhibitors, such as clavulanate and tazobactam. Class C β-lactamases are active against cephalosporins. Class D includes cloxacillin-degrading enzymes (Bush, 2001; Jacoby and Munoz-Price, 2005; Walsh, 2008). 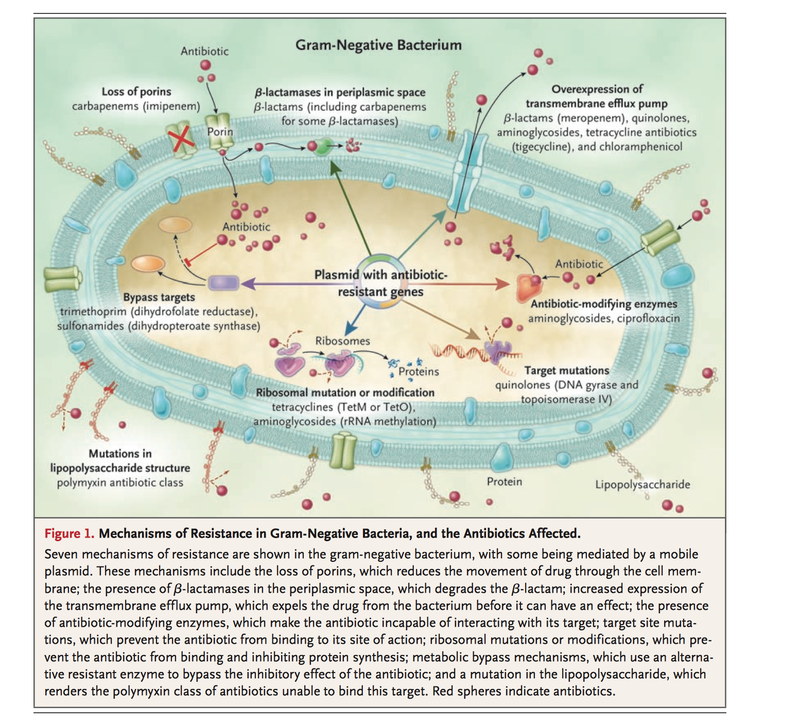 In general, gram-positive bacteria produce and secrete a large amount of β-lactamase. Most of these enzymes are penicillinases. The information for staphylococcal penicillinase is encoded in a plasmid, and this may be transferred by bacteriophage to other bacteria. The enzyme is inducible by substrates, and 1% of the dry weight of the bacterium can be penicillinase. Streptococci, including Streptococcus pneumoniae, and enterococci are relatively resistant to gentamicin and most other aminoglycosides owing to failure of the drugs to penetrate into the cell. 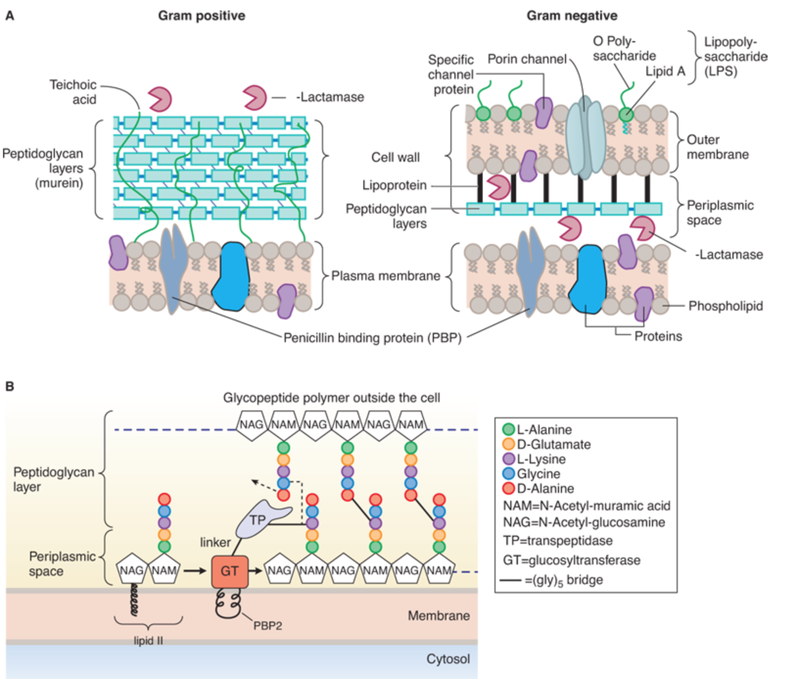 However, the primary mechanism of resistance to amino glycosides especially in gram-negative bacteria, involves the plasmid-mediated formation of inactivating enzymes. In addition, resistance to streptomycin, which is common, appears to be due to changes in the ribosomal binding site. Methylase production and methylation of the receptor site are established mechanisms of resistance of gram-positive organisms to macrolide antibiotics. Such enzymes may be inducible by macrolides or constitutive; in the latter case, cross-resistance occurs between macrolides and clindamycin. Increased expression of efflux pumps is also a mechanism of macrolide resistance. Esterase formation is a mechanism of macrolide resistance seen in coliforms.